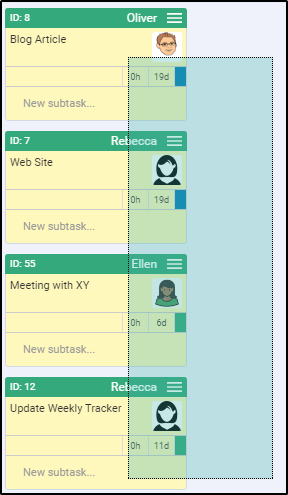 To keep your board from getting cluttered, you have to move all completed tasks into the "Ready to Аrchive" column (the folded column on the right side of the board). 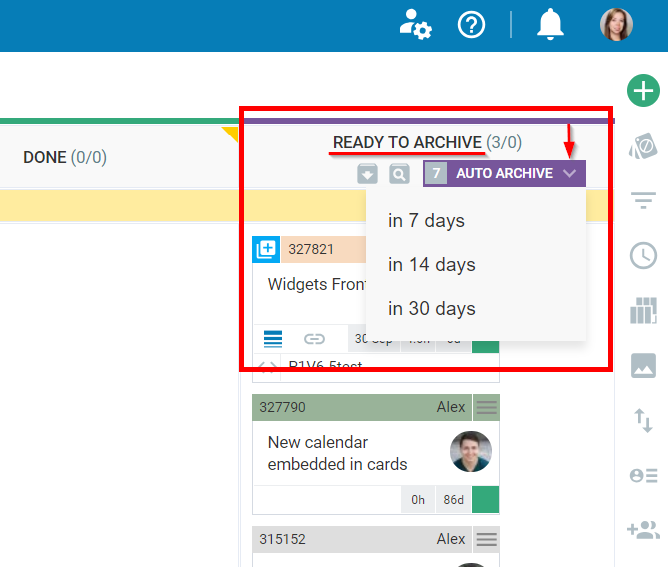 The "Ready to archive" column represents the Temporary Archive, where you keep completed tasks for a certain period of time (7/14/30 days). After that time period expires, the cards will be automatically moved to the Permanent Archive, depending on your settings. Important: The items in the Permanent archive are zipped up and they can be restored anytime if needed. 2. How to set up your Archiving process? There is a mechanism to ease the process of archiving completed cards. When cards are moved in the "Ready to Archive" column, they will be automatically archived 7 days later (this is a default setting). This prevents your board from getting cluttered and improves the overall system performance. Account Owners and Workspace Managers will be able to change the auto-archiving cadence. The process runs every day and checks if the cards have stayed 7/14/30 days, depending on your settings. 3. How to move cards into the "Ready to Archive" column? There are several ways to move cards to the "Ready to Archive" column. Drag out a rectangle to select multiple cards and drop the cards to the "Ready to Archive" column. When the cards are placed in the "Done" column, you can use the Card context menu to move them to the "Ready to Archive" column. Select the cards -> open the menu or right click on the cards -> select Move from the panel -> then Right and the cards will be moved to the "Ready to Archive" column as this is the first column next to "Done". Move cards one by one to the "Ready to Archive" column from the Position Control view in Card Details. Open the card -> the Position Control view is located at its bottom. It mirrors the workflow stages of the board where the selected card is currently located. Select the "Ready to Archive" stage and update your card. It will be instantly moved to the desired position. NOTE: Using this approach, you can move the cards one by one. 4. How to manually move cards from the Temporary Archive to the Permanent Archive? In the panel that opens, you will see а list of all cards currently located in the columns: "Done" and "Ready to Archive". You can either choose to permanently archive all cards or only certain cards from the list. Remove the check mark of those cards that you do not want to archive. Click on Archive cards button and all cards will be transferred to the Permanent Archive. Important: You can create versions of the archived cards for a better history tracking. The system allows you to group together the cards and save them under a Category name. For example, you can archive every release cycle and name it by release. This means you can just browse through the permanent archive by release name to find the historical list of tasks in each release. 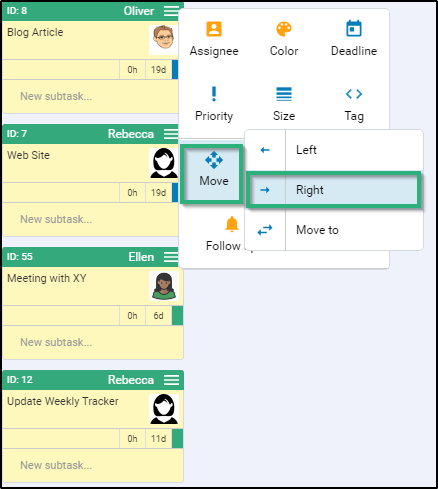 To create a folder (group of card) - check mark all cards that will belong to the group -> enter the Version name at the bottom of the panel and select Archive cards. (1) You can archive in a group all cards, which belong to a given project (Project A) -> Create a version -> name it Project A. This will help you to easily refer to the cards from Project A, while searching the Permanent archive. 4. How to find cards in the Permanent Archive? To find/see cards that have been permanently archived -> click on the the Show Permanently Archived cards icon to open the corresponding storage place. (1) The Permanent Cards archive tab provides a list of all cards that you have archived. It allows you to narrow down your search and define the time range for which you want to implement a search. Select the From/To dates from the calendar picker -> click on Search to generate the results. You can easily find cards that you have archived a few months ago. (2) The Browse Version tab provides a list of all tasks archived in groups under a Version name. Click on the plus icon to see all cards that belong to a certain category name. 5. How to Unarchive a Card? Use the Unarchive card button to the right of the card in the Archive storage place to unarchive a given card.Select the button and the card will automatically goes back to the "Temporary Archive" column of the corresponding board.